It’s October the 12th… happy National Gumbo Day! Did you know–celery is a traditional ingredient in this much beloved classic dish. Originating in Louisiana, gumbo is the official cuisine of that state, and is a type of stew or soup that’s usually served over rice. 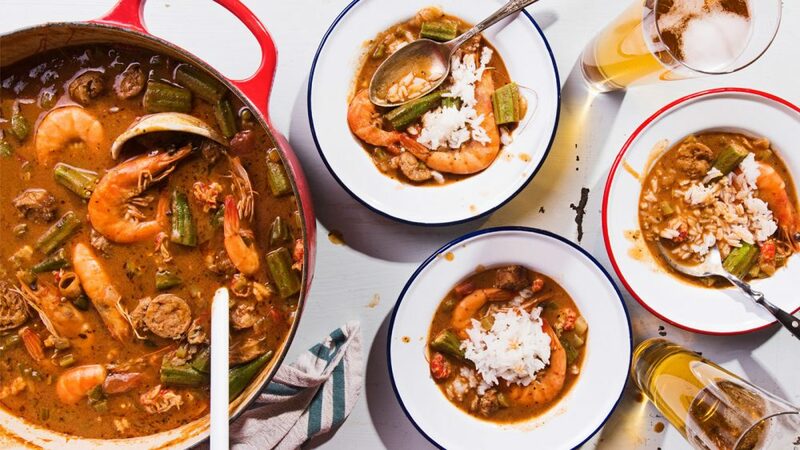 The word ‘gumbo’ comes from the African word for ‘okra’, which is a main ingredient that flavours and thickens the stew. As to the stew itself, it usually has lots of yummy ingredients, including a strongly flavoured stock, the ‘Holy Trinity’ of veggies (celery, onion, bell peppers), seafood, and of course okra. It was first described in 1802, and became very popular since the 1970s. The dish’s origin likely comes from a mix of several cultures, including French, Spanish, German, Filipino, West African, and Choctaw. Gumbo for me and my sister meant hours peeling shrimp or chopping seasoning a day or two before a major holiday. It meant the first course of Thanksgiving or Christmas dinner. It meant an appetizer as filling, rich and complicated as the many courses that followed it. Gumbo meant that God was in His heaven and all was right with the universe. Clean the crabs, removing the lungs, heart and glands and other parts so that only the pieces of shell containing meat (including the legs, swimmers and claws) remain. Refrigerate the meaty parts of the crabs. Put the portions of the crabs that have been removed into a 6- or 8-quart stockpot. Add the shrimp heads and shells and 5 quarts water to the pot and bring to a boil over high heat. Reduce the heat to low and simmer for 30 minutes. Remove from the heat. Cook the sausages in a skillet in batches over medium heat, turning occasionally, until the pieces are slightly brown and much of the fat has been rendered. Remove the sausage and set aside on a paper towel-lined plate to drain. Discard the excess fat remaining in the skillet before cooking the next batch of sausage. Once all the sausage has been cooked, wipe the excess oil from the skillet, being careful not to scrub away those bits of sausage that have stuck to the bottom of the skillet. Add the 2 tablespoons vegetable oil. Heat the oil over medium heat and then add the okra. Lower the heat to medium and cook the okra until it is slightly brown and dried, stirring frequently, about 45 minutes. While the okra cooks, place the 1/2 cup vegetable oil in a 12-quart stockpot. Heat the oil over medium heat. Once the oil is hot, a tablespoon at a time slowly add the 1/2 cup flour to prepare the roux, stirring constantly. Once all the flour has been added, continue heating and stirring the roux until it becomes a medium brown color, somewhere between the color of caramel and milk chocolate, about 10-15 minutes. Add the onions to the roux, stirring constantly. Once the onions are wilted, add the garlic, parsley, celery, green onions and bell pepper. Strain the seafood stock into the large stockpot. Add the browned sausage and bay leaves and bring everything to a boil over medium-high heat. Then reduce the heat to medium and continue to cook. Once the okra is cooked, add it to the gumbo pot. Continue cooking the gumbo for 60 minutes. Add the reserved crabs and shrimp and cook for 15 minutes longer. Remove the gumbo from the heat and stir in the Creole seasoning and filé powder. Let the gumbo rest for 15 to 20 minutes. As it cools, oil should form on the top. Skim the oil with a ladle or large spoon and discard. Stir in the picked crab meat. Taste the gumbo and adjust seasoning with more salt and pepper as needed. Serve the gumbo ladled over steamed rice. Image from Tasting Table (x).